Our Y - Strainer is precisely engineered to offer excellent performance under exact conditions created by high pressure as well as temperature. Y Type Strainer offered by us is available with perforated screen lined with related wire mesh that assures perfect straining. 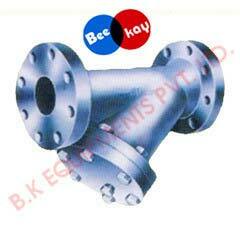 We stand among the major Stainless Y Strainer Manufacturers, based in India. Our Flanged Y Strainer is available at very competitive prices within the stipulated timeframe.